Editor of "Building World," etc. Cabinetwork and Joinery is a natural outcome of* and sequel to, Cassell's Carpentry and Joinery, with which work it is uniform in style and price. Whilst the chief object of that work was to explain constructive principles adopted in the related crafts of carpentry and joinery, the present purpose is to give some hundreds of examples showing further how these principles are applied in everyday practice. The reader is here assumed to be acquainted with hand tools and appliances—their shapes, care, and uses; with timber—its qualities, varieties, and selection; with the different forms of joints and their adaptability to various conditions; with the setting out of work—including the preparation of rods; and with the principles of construction in woodwork; all these matters are fully dealt with in Woodworking and in Carpentry and Joinery, the earlier volumes in this series. 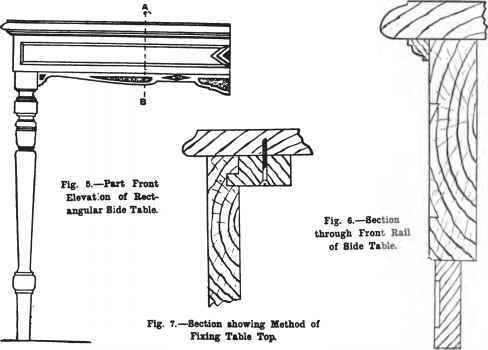 The present book devotes but little space to the rudiments of cabinetwork and joinery, but makes a direct and immediate appeal to the constructive instinct of the craftsman by presenting him with an extensive and varied range of designs of completed articles, accompanied by full explanatory notes. No less than 250 different designs with details are included in this book, the illustrations numbering 2,021 in all. In almost every case the objects here illustrated have been made by their designers, who also contributed the original drawings and descriptions either to Work or to Building World, and it is from the columns of those two weekly journals that this volume has been compiled The thoroughly practical character of the work is thus assured, the contributors including the foremost master-craftsmen of the day. Emphasis is laid on the fact that the book is concerned with actual practice only. In every case the designs are workmanlike, and the host of detail illustrations—of which this book certainly contains more than any other of its kind, if any other exists—will be welcomed by all craftsmen who seek for thoroughness and sound constructional practice. La Belle Sauvac.e, London, E.C.